HE HATED PIGEONS with live score by MORNING SHOW Canada/Chile, 2015 Spanish with English subtitles/ 80' Director/Writer: Ingrid Veninger Fri-Sept, 2 7 PM | The Cinematheque A slow-burning odyssey about love and loss featuring newcomer Pedro Fontaine in the title role of Elias, a young man who travels from the northern Atacama desert to the southern Patagonian edge of Chile on a cathartic journey of the spirit, and to fulfill the wish of his mysteriously deceased lover. 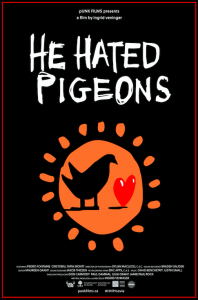 Every screening of He Hated Pigeons is presented with a uniquely improvised, ever-changing live score. Linked with the uncertainty of the protagonist's journey, the audience is part of something which has its own intrinsic impermanence. Never again will the film be seen with the combination of elements presented at the Vancouver Latin American Film Festival. “This film is a remarkable experience not soon forgotten.” Jason Gorber, Twitch Film Esta road movie, filmada en Chile, sigue el viaje de un joven desde el norte del desierto de Atacama hasta el sur de la Patagonia, viaje mediante el cual, deberá de cumplir una promesa. La proyección de la cinta será acompañada por música en vivo, y será la única oportunidad en Vancouver para poder verla de esta manera.